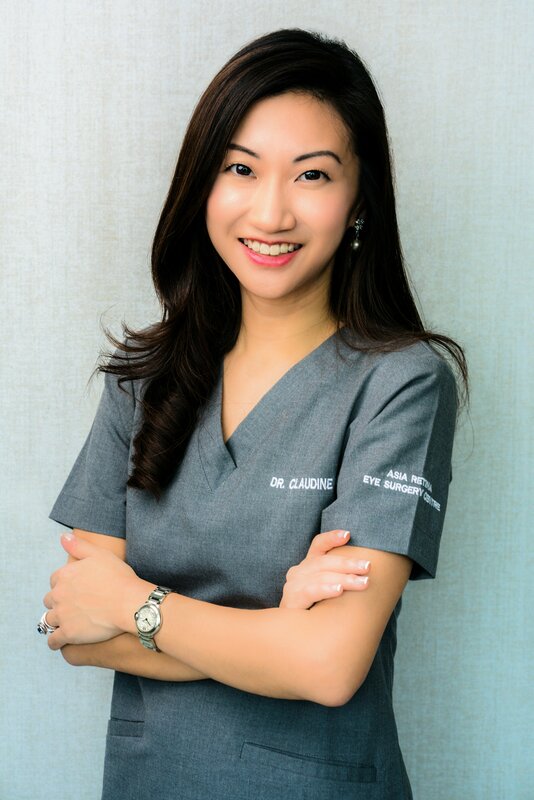 Dr. Claudine Pang graduated with a Double Bachelor in Medicine and Surgery (MBBS) with Distinction and Gold Medal in Medical Ethics from the National University of Singapore in 2004. She was in the ophthalmology department at the Singapore National Eye Centre for 8 years, during which she received her post-graduate degrees in Ophthalmology including the Membership to the Royal College of Surgeons in Edinburgh (MRCSEd), Fellowship of the Royal College of Surgeons in Edinburgh (FRCSEd) and Fellowship of the Academy of Medicine, Singapore (FAMS). She also received specialist accreditation in Ophthalmology with the Ministry of Health. Dr. Pang received extensive overseas exposure in the subspecialty fields of both Medical Retina and Vitreoretinal Surgery. She completed an 18-month fellowship at the renowned Vitreous-Retina-Macula Consultants of New York, Manhattan Eye Ear and Throat Hospital, New York, where she worked under the mentorship of Dr. Lawrence Yannuzzi, a highly respected pioneer in the ophthalmic-retinal community. Following that, Dr. Pang was the first female in the world to receive the highly coveted William H. Ross Surgical Vitreoretinal Fellowship at the University of British Columbia in Vancouver, well-known for their surgical abilities in the world, where she spent another year under the mentorship of Dr. David Maberley, Dr. David Albiani and team. Dr. Pang also spent time with Professor Graham Holder at the world-renowned Moorfields Eye Hospital in London, United Kingdom, working on Retinal Electrophysiology and Genetic Retinal Diseases. Dr. Pang is an internationally recognised Retinal Eye Surgeon and has been a speaker at many international meetings and authored numerous peer-reviewed articles in the most-respected international ophthalmology journals in the world, where she was the first to describe novel clinical entities including lamellar hole epiretinal proliferation, pachychoroid neovasculopathy and ghost maculopathy. She has a special interest in Ophthalmic Retinal Imaging and has described novel techniques that improve imaging and diagnosis of vitreoretinal diseases. Dr. Pang has more than 13 years of ophthalmology experience and has performed thousands of cataract and retinal surgeries. In addition to cataract surgery, her main forte is in retinal detachment surgery, macular surgery, myopic diseases, age-related macular degeneration, polypoidal choroidal vasculopathy, central serous chorioretinopathy, inflammatory retinopathies and inherited retinal diseases. Dr Pang established Asia Retina Eye Surgery Centre with the vision to provide quality eye care in a comfortable setting with attentive and personalized care. Realizing the public’s limited understanding about the retina, Dr Pang aims to spread awareness on methods to preserve retinal health and overall eye wellness. Outside of ophthalmology, Dr. Pang is a mother of 2 children and enjoys an active lifestyle including marathons and pilates. She also enjoys baking in her spare time. In addition to her passion for quality patient care, her patients appreciate her personal, gentle touch and approachable nature. Dr. Pang believes firmly in giving back to community even from a young age. She is a strong advocate of family mission trips, where she brings her young children to help underprivileged people in under-developed countries. She also organizes regular medical mission trips for the entire Asia Retina Eye Surgery Centre Team, focusing on eye screening and performing cataract surgery for the villagers with no access to proper eye care.